A burrito, or taco de harina, is a type of food found in Mexican and Tex-Mex cuisine. It consists of a flour tortilla wrapped or folded around a filling. The flour tortilla is usually lightly grilled or steamed, to soften it and make it more pliable. In Mexico, refried beans, Mexican rice, or meat are usually the only fillings and the tortilla is smaller in size. In the United States, however, fillings generally include a combination of ingredients such as Mexican rice, beans, lettuce, salsa, meat, avocado, cheese, and sour cream, and the size varies, with some burritos considerably larger than their Mexican counterparts. Burritos enjoy an immense following that rivals those of hot dogs, hamburgers, pizza and other fast, convenient foods. The word burrito literally means "little donkey" in Spanish, coming from burro, which means "donkey". The name burrito possibly derives from the appearance of a rolled up wheat tortilla, which vaguely resembles the ear of its namesake animal, or from bedrolls and packs that donkeys carried. 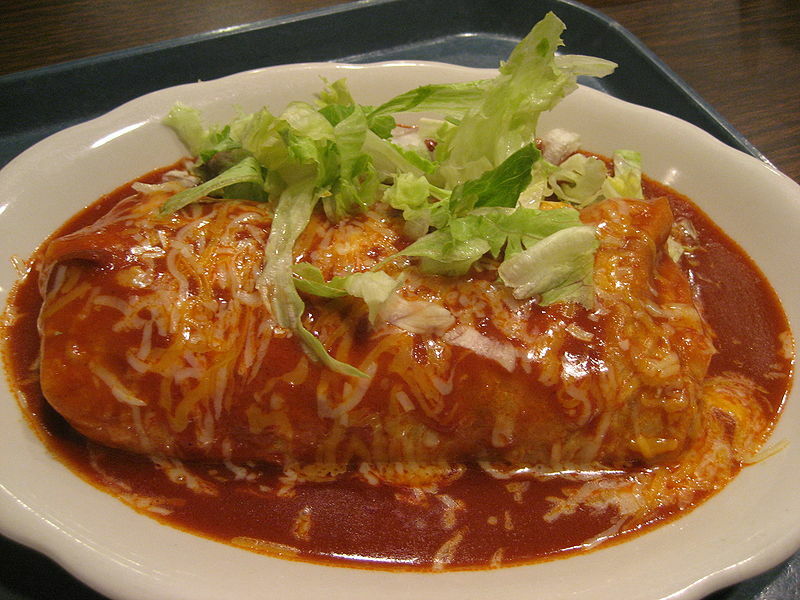 One very common enhancement found in the United States is the wet burrito (also called an enchilada-style burrito), which is a burrito smothered in a red chile sauce similar to an enchilada sauce, with shredded cheese added on top so that the cheese melts. 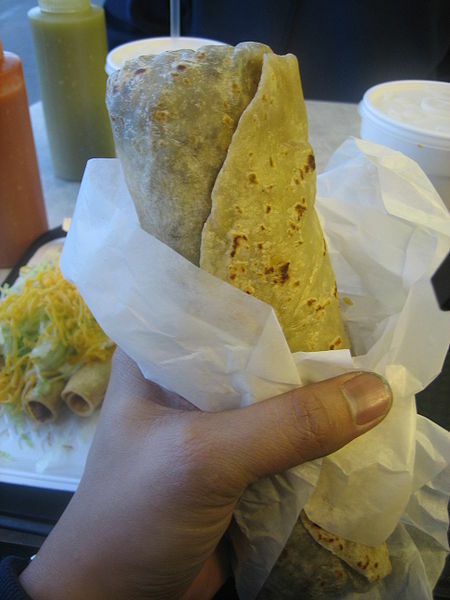 This type of burrito is typically placed on a plate and eaten with a knife and fork, rather than being eaten while held in hand.